Lessons in Violin, Viola, Piano and Music Theory are available for the Palm Beach County Florida area: Palm Beach, West Palm Beach, Wellington, Royal Palm Beach, Lake Worth, Boynton Beach, Delray Beach, and Palm Beach Gardens. We are located at the border of Wellington, Royal Palm Beach and West Palm Beach just off of Southern Blvd. Acceptance is by interview/audition where and when we test for musical abilities. For more information about current lesson openings call/text 561-923-0465 or email us at BellissimaMusicAcademy@gmail.com. The Bellissima Music Academy curriculum is designed for optimal advancement of each student. We create an atmosphere for musical growth and technical mastery where students can reach their fullest potential. Regular recitals and other performance opportunities are an important part of the program. We are dedicated music teachers that invest our time with the students for their full musical potential. We have a simple teaching philosophy: one of our best strength as music teachers is motivating and inspiring students to become the best musicians they can be. 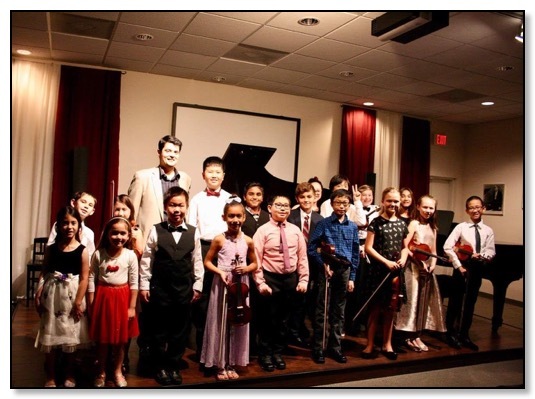 As a result, many of our beginner students continue their studies and have become advanced players performing with their youth and/or school orchestras as leaders and on occasion as soloists. Our approach to every student is individual, designed to bring out expressive musicality through mastering instrumental technique. Previous students of Dr. Popov and Ms. Eriko have won numerous contests and have played in leadership positions in their youth orchestras and schools. Former students have been accepted to leading music conservatories/universities and have been successful as professional musicians in the United States and abroad. We proudly support Music Programs at our schools in the area and take special care in preparing students for auditions to BAK Middle School, Dreyfoos High School, Youth Orchestras of the Palm Beaches and others. Bellissima Music Academy does not and shall not discriminate on the basis of race, color, religion (creed), gender, gender expression, age, national origin (ancestry), disability, marital status, sexual orientation, or military status, in any of its activities or operations. These activities include, but are not limited to, hiring and firing of staff, selection of volunteers and vendors, and provision of services. We are committed to providing an inclusive and welcoming environment for all members of our staff, clients, volunteers, subcontractors, vendors, and clients. Bellissima Music Academy is an equal opportunity employer. We will not discriminate and will take affirmative action measures to ensure against discrimination in employment, recruitment, advertisements for employment, compensation, termination, upgrading, promotions, and other conditions of employment against any employee or job applicant on the bases of race, color, gender, national origin, age, religion, creed, disability, veteran's status, sexual orientation, gender identity or gender expression.